When it comes to the climate arena, the United States and China are enjoying a wave of international goodwill resulting from the role each played in rallying other nations to achieve the iconic Paris climate agreement. In November 2014, China and the United States stood shoulder to shoulder as the first two countries to announce their post-2020 national greenhouse gas emission reduction targets and remained constructive partners on the path to reaching a historic outcome in Paris this past December. Now, as the United States and China put new policies in place to achieve their national targets and fulfill their domestic and international commitments, both countries confront a common challenge: mobilizing sufficient investment at home to meet domestic energy, climate, and environmental protection goals, while at the same time steering outbound investments toward sustainable projects in other nations that support, rather than undermine, those nations’ climate targets. In this Center for American Progress issue brief, the authors consider the key domestic and international policies that were recently—or are currently being—put in place by China and the United States to achieve their respective climate goals. In addition, we evaluate the implications of these policies—both positive and negative—for green investment domestically and globally. Finally, we provide recommendations for enhanced cooperation in this space. China and the United States emerged from Paris with clear climate goals but incomplete blueprints for how they would achieve them. To a large extent, this was inevitable, as there are no silver bullets for the kinds of ambitious transformations that the United States and China have committed to achieving. Rather, both countries need to develop a range of new policies across a number of interrelated sectors to either replace or build upon the policy landscape that currently exists. Regardless of the path each country pursues, however, one thing is increasingly clear: Mobilizing finance will be critical to achieving the needed emission reductions. Reduce carbon intensity—which is the amount of carbon emitted per unit of gross domestic product, or GDP—to 60 percent to 65 percent below 2005 levels around 2030. China already has a number of domestic policy measures in place to move it toward these climate goals. Those existing policy measures include increasingly stringent energy efficiency standards for motor vehicles, industrial equipment, and appliances; a feed-in-tariff scheme that pays renewable energy producers a premium for the power they generate; and fast-track coal control and emission peak programs that impose particularly ambitious coal use and emission reduction targets in regions that, when added together, produced more than 66 percent of China’s GDP in 2014. In addition, under China’s new five-year plan for 2016 to 2020, its leaders are working to reform the electric regulatory system and impose more stringent coal caps in the nation’s inland and western regions. Power-sector reform will be particularly critical to this effort because China’s state-run power grid has been a bottleneck for clean energy expansion. In September 2015, Chinese President Xi Jinping stated that Beijing plans to move the nation toward a “green dispatch” system that would put renewable energy at the top of the priority list for transmission across the nation’s overloaded power grids. That would be a critical step toward meeting China’s international commitment to nearly double the nonfossil fuel portion of its energy mix by 2020. China’s other major new climate policy is a national emissions trading system that is expected to cover the nation’s power sector as well as six or more major industries starting in 2017. The effectiveness of these and other new policies remains to be seen, but there is wide recognition that any path forward will require scaled-up investment. When Chinese officials speak of “green finance”—which they do increasingly frequently—they are referring precisely to the public and private investment that China will require to meet its environmental challenges, which include its climate targets. According to the latest estimates, China will need to invest up to $6.7 trillion in low-carbon industries by 2030, or around $300 billion to $445 billion per year over the next 15 years to meet its goals under the Paris Agreement. According to China’s Institute of Finance and Capital Markets, at most, only 10 percent to 15 percent of that investment will come from public funds; the vast majority will need to come from the private sector. Meanwhile, in the absence of comprehensive energy and climate legislation, the Obama administration is working to implement a series of policies and regulations needed to put the United States on a track to achieve its Paris commitment of 26 percent to 28 percent reduction in greenhouse gas pollution below 2005 levels by 2025. As of 2015, U.S. emissions were 12 percent below 2005 levels, so the trajectory is consistent with the target. At the federal level, this includes the Clean Power Plan, which will for the first time regulate greenhouse gas emissions from power plants; performance standards for motor vehicles; regulations on methane emissions from new oil and gas sources; and reforms to U.S. policy on coal leasing on public lands, all of which are being complemented by action at the state and local levels. All told, the United States and China are making significant efforts to reduce domestic emissions. Both countries are demonstrating strong leadership on domestic climate policy, and that has opened up new opportunities for mutually beneficial bilateral and multilateral cooperation. The United States and China are already collaborating through the Climate Change Working Group, which has launched multiple collaborative projects under the U.S.-China Strategic and Economic Dialogue, or S&ED; the U.S.-China Clean Energy Research Center, which brings U.S. and Chinese experts together for joint clean energy technology development; and the Mission Innovation initiative, which aims to raise research and development funding across multiple sectors, including clean energy sectors in the United States and China. U.S. and Chinese officials also are engaged in a Domestic Policy Dialogue, formally established at the 2015 S&ED, which is a bilateral forum for sharing lessons learned from each nation’s climate policy experiences to date. Going forward, there is room to expand these initiatives. Possible areas for enhanced cooperation on domestic policy include reducing non-carbon dioxide greenhouse gas emissions, improving measurement capabilities for land-use and forestry-sector climate impacts and for policies for the power sector, technological innovation, and resilience policy. Despite the array of collaborative exchanges that are already underway, the United States and China are not yet collaborating in any significant manner on one of their most important shared challenges: how to mobilize private-sector investment to achieve their emission reduction goals. Building out a new clean energy economy requires significant investment capital. Going forward, both nations will try out different approaches to catalyze those investments. Domestic climate policy and investment policy are mutually reinforcing. Without clear, stable, and consistent climate policies, private firms cannot easily finance investments in low-carbon technologies. Understandably, banks are unwilling to make loans to projects where a reasonable return on investment cannot be expected. This is where policies such as Production Tax Credits, or PTCs; feed-in tariffs for renewables; performance standards; carbon taxes; or emissions trading programs come into play by creating economic return for cleaner technology industries. Such policies create markets for low-carbon technologies and thereby spur greater investment in clean energy. Even so, barriers to financing still can exist for newer technologies that are perceived as risky. Here again, smart renewable investment incentives delivered though Investment Tax Credits, or ITCs; Production Tax Credits, or PTCs; or loan guarantees can help firms obtain financing that otherwise would be unavailable through private capital markets. The United States has fostered support for domestic clean energy investment through policies designed to reduce the cost of capital necessary to finance these projects. These policies include tax breaks in the federal tax code and several loan programs. To help companies seeking to commercialize new clean energy technologies, for instance, the U.S. Department of Energy disburses Title XVII loan guarantees for clean energy projects and Advanced Technology Vehicles Manufacturing, or ATVM, loans for automakers to increase transportation fuel efficiency. Title XVII loan guarantees help fledgling clean energy companies secure investment at more affordable rates than they would on their own because the federal government assumes some of the financial risk associated with new technologies. These types of programs allow companies to attract the investment necessary to develop commercial-scale production and build the clean energy marketplace. The federal programs have helped create or save an estimated 56,000 jobs through 2015 and have prevented 25 million metric tons of carbon dioxide emissions, equivalent to removing 5.28 million cars from the road. On the other side of project development, the federal government provides an ITC and a PTC to attract investment in new clean energy projects. These two tax credits are central to U.S. clean electricity development and can be claimed by clean electricity generators and investors according to the cost of initial investments or electricity produced over time. From 2000 to 2013, the PTC supported the generation of approximately 417 billion kilowatt hours of clean electricity and recently has been extended with a phasedown through 2020. The ITC, which has been extended with a phasedown through 2022, predominantly supports solar projects and has been credited with helping the solar industry grow by more than 1,600 percent since 2006 and increasing solar employment in the United States by 86 percent since 2011. These programs and others—including the Advanced Energy Manufacturing Tax Credit, the Energy Efficiency and Conservation Loan Program, and Qualified Energy Conservation Bonds—have all supported more than $442 billion of clean energy investment in the United States since 2007. Since 2008, they have helped wind and solar power more than triple in capacity and will continue to fuel growth. 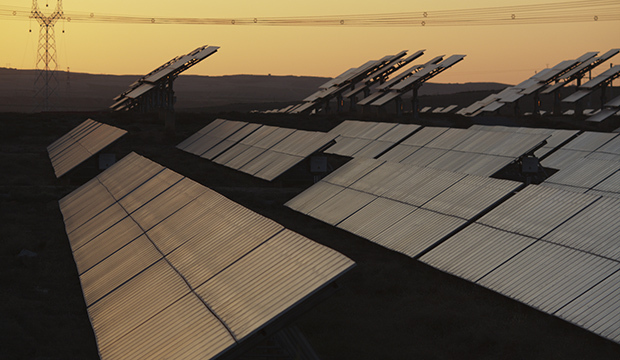 For example, by 2020, the extension of the ITC is expected to support an additional 100 gigawatts of solar power and some $40 billion in investment specifically because of its extended tax credit. In 2015, $56 billion was invested in U.S. clean energy sectors, which amounts to an 8 percent increase from the year before. China, meanwhile, leads the world in clean energy investment. In 2015, $110.5 billion was invested in China’s clean energy sector, a 17 percent increase over the previous year and twice the U.S. investment total of $56 billion. Much of this investment has been driven by the market formation policies in support of renewable energy discussed above, most notably China’s feed-in tariffs for wind and solar power. Now Chinese leaders are introducing a new array of financial incentives designed to move beyond clean energy market stimulation measures to address specific market failures in clean energy finance. As mentioned above, even when there are good market demand signals for clean energy, individual technologies and firms still can fall through the cracks, particularly if they are working on breakthrough technologies that do not yet have a strong track record of commercial market success and are therefore seen as risky investments in private capital markets. Just like the United States, China is looking for ways to lower the risks and transaction costs associated with such investments. Beijing is rolling out multiple new initiatives on this front, some of which could provide new opportunities for U.S.-China cooperation. Green finance refers to financing or financing mechanisms—for example, loans, bonds, or insurance—that support any project with environmental benefits, both climate and nonclimate related, from public transportation to clean energy to improved water quality. Green finance also can refer to efforts by businesses and banks to track and disclose the climate implications of their investments and/or incorporate climate indicators—such as a potential carbon price—into their cost-benefit and risk-return analyses. Climate finance, often referred to as international climate finance, generally refers to the suite of public and private assistance and investment that flows between countries to support reduced greenhouse gas emissions and enhanced resiliency. Chinese policymakers tend to use the term “climate finance” when referring to the climate financing commitments made in the U.N. Framework Convention on Climate Change. Green bonds. Beijing is encouraging banks, corporations, and municipalities to conduct research on and experiment with issuing debt securities earmarked for green projects. Green stock indices. Beijing is encouraging stock market regulators to experiment with indices that exclude fossil fuel projects and other projects with high environmental or climate risks. Preferential green loans. Beijing is encouraging regulators to experiment with new programs such as loan guarantees or interest subsidies that reduce the costs associated with green project loan financing. Beijing echoed this green finance call again in its 13th Five-Year Plan released in March 2016. China’s new five-year development plan for 2016 to 2020 encourages the development of a “green finance system” with particular focus on green loans, green bonds, and a new green development fund. China’s green finance push appears to be following the same trajectory as other Chinese policy initiatives: The central government pilots several programs around the country, watches to see how those programs change behavior, and then tweaks the policies as needed to fine tune the outcomes while scaling up to the national level. See Figure 1 in the PDF for the Chinese government agencies that are leading the nation’s green finance push. Of the new financing tools, green bonds have generated the most enthusiasm in China. In December 2015, the People’s Bank of China, or PBOC, issued the country’s first green financial bond guidelines to lay a regulatory framework for green bonds issued by banks and corporations. China’s National Development and Reform Commission, or NDRC, followed suit later that month with green bond regulations for enterprises and municipalities. As soon as that regulatory framework emerged, investors rushed in. In the first quarter of 2016, China issued $7.9 billion in green bonds, accounting for nearly half the global quarterly total of $16.9 billion. Quickly, China overtook the United States as the largest green bond issuer in the world. The United States came in second at $3.4 billion. Some analysts predict that China’s green bond markets could raise $230 billion in sustainable investments over the next five years. Those are impressive investment totals, but it is not yet clear how much impact they are having in terms of redirecting capital flows away from dirtier projects and toward cleaner projects. One particularly difficult problem is the question of what counts as a so-called green project in China. The PBOC and the NDRC have issued different investment edicts, so a project eligible for green bonds under the PBOC guidelines and catalogue may not be eligible under the NDRC guidelines. One commonality between the two is that both allow some coal projects to qualify for green bonds. The NDRC regulations include investments in energy efficiency and emission reduction technologies for coal plants, and the PBOC regulations state that green bonds can be used to invest across the coal sector, including in high-efficiency, supercritical, or ultra-supercritical coal-fired power plants; coal washing and processing technologies; coal mining; and petroleum refining. Beyond concerns about conflicting implementation, these regulations seem to be inconsistent with Beijing’s recent decision to halt new coal construction. In addition, it is unclear if—and to what extent—China’s green bonds are sufficiently concessionary—that is to say, do they offer terms that are more attractive than what companies could get otherwise on the commercial market to shift the investment landscape and redirect investment flows toward green projects? Put another way, in the absence of green bonds, would these same projects have been financed anyway? Going forward, China could improve the effectiveness and integrity of this program by tightening and standardizing the definitions for what types of projects are eligible and determining the effects of various forms of concessionality on project selection and overall portfolio impact to ensure that green bonds are in fact a cost-effective policy tool. International finance: Going green or brown? In the post-Paris era, the United States and China not only will need to grapple with domestic green finance challenges but also will play critical roles in determining whether the world meets the climate challenge through their roles in overseas investment and assistance. Moreover, there is reason to be concerned that absent policy intervention, China’s overseas investments will skew “brown”—toward fossil-fuel-intensive energy infrastructure—rather than “green”—toward a low-carbon pollution future. This would undermine global efforts to achieve the goals of the Paris climate agreement. While this section of the brief focuses on policies in the United States and China that shape and direct overseas investments and assistance, it is important keep in mind the central role of the host country to which the investments flow in all of this. The Paris Agreement provides some very useful parameters in this regard, as virtually every country in the world has committed to a plan to reduce domestic emissions and, collectively, to the goal of limiting global temperature rise to below 2 degrees Celsius. The United States has ramped up its international climate assistance over the past six years, reaching $15.6 billion of public support between 2010 and 2015. This includes bilateral assistance; public support provided by the U.S.’s development finance institution and export credit agency, which in turn leverages significant additional private green finance; and U.S. support though multilateral institutions such as the World Bank. As part of this effort, the United States has committed to provide $3 billion to the Green Climate Fund by 2020 and delivered its first installment of $500 million earlier this year. The other side of the coin is the extent to which the United States is working to limit its public support for overseas assistance and investment and public assistance for highly polluting technologies, infrastructure, and other projects that do not move countries along a path of sustainable economic development consistent with the Paris climate agreement. On this front, the United States also has made progress, though more work remains to be done. In 2013, President Barack Obama announced that the administration would not provide public support for new coal plants overseas except in “rare circumstances,” a policy now shared by the World Bank and a number of other countries around the world. The administration’s announcement also helped make possible a 2015 agreement by all Organisation for Economic Co-operation and Development export credit agencies to eliminate financing for new coal plants that were not ultra-supercritical by 2017, albeit with exceptions for supercritical coal power plants smaller than 500 megawatt capacity and subcritical coal power plants smaller than 300 megawatt capacity built in International Development Association-eligible countries. In addition, in 2014, President Obama issued executive order 13677, which requires U.S. government agencies to factor climate resilience considerations systematically into the federal government’s international development work. In other words, U.S. foreign assistance programs should not promote maladaptation to climate change or worsening resilience. In China, the situation is more complicated and, from a climate perspective, potentially perilous if the necessary policy guidelines are not instituted quickly. On one hand, China has for the first time demonstrated a new willingness to participate directly and publicly in international climate aid efforts by launching and then pledging 20 billion renminbi, or $3.2 billion, for the new China South-South Cooperation Fund on Climate Change. China also supports green finance initiatives internationally though the World Bank and other multilateral development banks. In contrast to these instances of positive investment strategies that promote sustainable economic growth and development through cleaner energy, adaptation, and climate resilience, the Chinese government does not appear to have any overarching technical guidelines or policies governing its overseas development investments or aid to avoid negative investment outcomes. 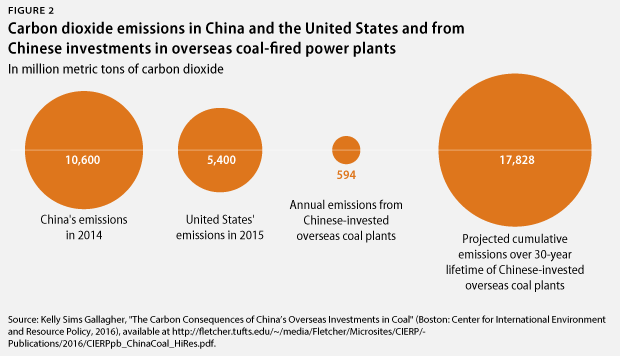 Unlike the United States, for example, China does not impose limitations on public financing for highly polluting projects in other nations, such as high-emission coal plants. The lack of overseas investment guidelines is triggering concerns that China may continue to make green investments at home and brown investments abroad. Some observers speculate that this investment inconsistency could be intentional. Coal, steel, cement, and other pollution-intensive heavy industry sectors are suffering from overcapacity in China. Where overcapacity is particularly acute, investing in heavy industry projects abroad is generally seen as a winning strategy for creating new export markets to absorb excess production in an era of declining demand at home. In the open market, firms would react to weaker demand by scaling back production or closing down. If clean energy policies swing demand from coal to renewable sources, the market should follow suit. In China, however, coal and other heavy industry sectors are dominated by state-owned enterprises with strong local government ties, access to cheap capital, and a tendency to leverage both of those advantages to keep their factories running regardless of the market’s ability to absorb what is produced. One thing those sectors have done when demand slows at home is to seek new markets abroad, often using state funds to do so. China’s new Belt and Road program is the epitome of that strategy. Under the program, Beijing is leveraging the nation’s diplomatic ties to help Chinese companies secure projects in other nations and then backing those projects through the country’s $40 billion Silk Road investment fund. Some observers are concerned that rising overcapacity in China’s domestic coal sectors combined with unclear environmental and climate standards for outbound investments will trigger a new wave of overseas Chinese coal investments that could counteract some of the good work China is doing at home to reduce greenhouse gas emissions. Officials in Shanxi Province—one of China’s biggest coal-producing regions—state that they are actively pushing coal companies to “go out” and build projects in Indonesia, Pakistan, and other Belt and Road nations to draw down the province’s excess coal capacity. If the goal is to maximize coal consumption in other nations, those investments could pose significant greenhouse gas emission risks. A majority of these power plants—58 percent—use subcritical coal technology, which is the most energy inefficient form of coal-fired power plant and therefore the type that is most carbon intensive. Most of the remainder were supercritical plants, which are approximately 12 percent more efficient than subcritical plants. One such plant, in Egypt, was an ultra-supercritical plant, which is the most energy efficient coal-fired power plant technology available. On an annual basis, this fleet of more than 50 coal-fired power plants was estimated to release 594 million metric tons of carbon dioxide, equivalent to 11 percent of total U.S. emissions in 2015 and 6 percent of total Chinese emissions in 2014—the latest year for which data are available. If a 30-year lifetime for these plants is assumed, they will emit 17,828 metric tons of carbon dioxide cumulatively, equal to slightly more than U.S. and Chinese emissions put together on an annual basis. China already is one of the biggest providers of international energy assistance through the China Development Bank and the Export-Import Bank of China. Now, it is establishing major new financial institutions, including the Asian Infrastructure Investment Bank, or AIIB; the New Development Bank, which is often referred to as the bank of Brazil, Russia, India, China, and South Africa, or the BRICS Development Bank; President Xi’s signature Belt and Road initiative; and China’s South-South Cooperation Fund on Climate Change. In light of this, guideline clarifications for both bilateral development aid and overseas investments represent an important opportunity for U.S.-China collaboration going forward. Not only would clarified policy statements be useful to guide investments and potentially harmonize standards, but the two nations could also once again demonstrate joint leadership. China and the United States could collaborate on positive, climate-friendly investment strategies—including on specific projects—and establish information-sharing protocols regarding these investments. Moreover, both countries could experiment with a wider range of investment programs, learning from each other’s successes. The most recent U.S.-China joint statement—on the occasion of President Xi’s September 2015 visit to Washington, D.C.—provides a promising diplomatic opening for bilateral engagements. During the visit, China pledged to “strengthen green and low-carbon policies and regulations with a view to strictly controlling public investment flowing into projects with high pollution and carbon emissions both domestically and internationally.” For its part, the United States reaffirmed its existing commitment to end “public financing for new conventional coal-fired power plants except in the poorest countries.” Both nations reiterated these commitments at the June 2016 U.S.-China Strategic and Economic Dialogue, or S&ED, meetings in Beijing. Given this alignment, the United States and China could work to maximize economic benefits for developing countries while minimizing environmental, social, and climate risks. Enhance bilateral cooperation on domestic policy. This would include work in the areas of gases other than carbon dioxide, improved measurement capabilities for land-use change and the forestry sector, technological innovation, and resilience. Devise common definitions for “climate finance” and “green finance” and set up a new collaborative initiative on domestic clean energy finance policy. The United States and China have different economic and political systems, so the same financing solutions will not always apply in both nations. However, China and the United States have enough in common that both would benefit from the exchange of best practices and lessons learned as they relate to clean energy finance. Clarify guidelines for both bilateral development aid and overseas investments. Not only would clarified policy statements be useful to guide investments and potentially harmonize standards, but the two countries could also once again demonstrate leadership by collaborating on positive, climate-friendly investment strategies and projects. Establish information-sharing protocols regarding these investments to promote transparency, learning, and improved practices over time. Launch a U.S.-China collaboration on mobilizing green finance abroad. These types of foreign investment should be aimed at helping the least-developed countries achieve the goals and targets that they set for themselves—such as their Nationally Determined Contributions—as part of the Paris Agreement. Just as the United States and China played decisive roles in the world’s ability to reach a climate agreement in Paris, the two countries will play decisive roles in the world’s ability to fulfill the terms of the accord. This will require that the United States and China not only mobilize green financing domestically—which is necessary to meet both countries’ respective national clean energy and carbon pollution reduction commitments—but also that they use their individual public overseas investment tools and assistance to help achieve the targets committed to in Paris. Through engagement and cooperation, green finance can be another constructive plank in the U.S.-China climate relationship. Melanie Hart is a Senior Fellow and Director of China Policy at the Center for American Progress. Pete Ogden is a Senior Fellow at the Center. Kelly Sims Gallagher is professor of energy and environmental policy at The Fletcher School, Tufts University. The authors wish to thank Blaine Johnson, Research Associate on China and Asia Policy, and Ben Bovarnick, Research Assistant on the Energy Policy team, at the Center for providing critical research support for this issue brief.